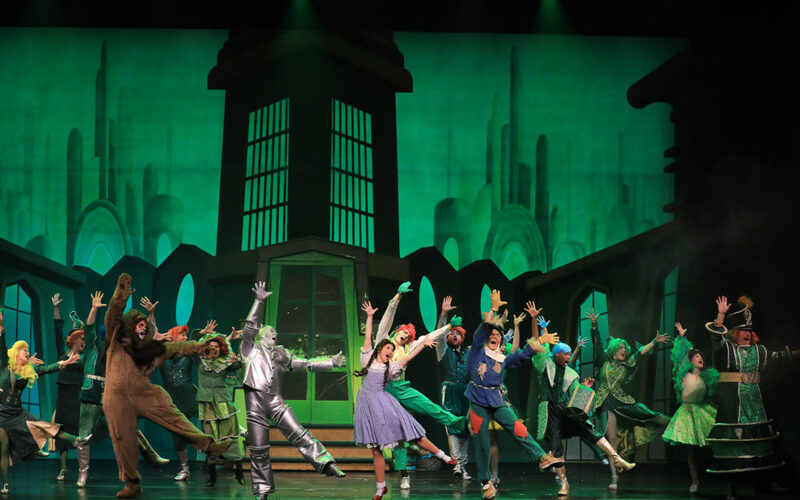 The classic characters of Oz come to life in the latest incredible performance of the Broadway musical adaptation of the hit film The Wizard of Oz. There really is no place like home to see this show, or at least no place like the Tennessee Performing Arts Center. The production value is through the roof for this performance. Elaborate sets, extravagant costumes and some incredible special effects really let you know this was a serious production. You get the sense of being right inside the twister with Dorothy. Dorothy, the Lion, the Tin Man and the Scarecrow are all portrayed magnificently. The actors really capture the essence of each character and you feel a sense of real hatred towards the Wicked Witch of the West right from the start. The horrendous witche’s laugh is still frightening just to think about. However, the show is stolen by none other than Toto. From his first appearance, the adoration of the crowd is palpable. The use of a real dog in an on-stage performance is always a risk, but the crew pulls it off thanks to the well-behaved Murphy, the dog who plays Toto. The other highlights of the performance are the musical numbers. With such classic songs such as “Over the Rainbow” and “Ding Dong! The Witch is Dead,” it isn’t tough for the whole crowd to get on board and sing along. The show has something for the whole family. For the parents, there is the nostalgia of watching the story you know and love come to life on stage right in front of you. For the kids, it has all the wonder of the original that made us all fall in love with the story in the first place. The imagination of the wondrous land of Oz, the hilarious jokes from the cowardly lion and the sense of relief and triumph each time the good witch of the north arrives really hold the audience’s attention and keep you waiting excitedly for the next scene. The only issues to find with this production are the occasional characters, the emerald city guard in particular, who can overstay their welcome and the overuse of some of the same jokes over and over again. Other than that, the whole show is a delight. The Wizard of Oz at TPAC will truly blow you away the moment you realize you’re not in Kansas anymore. Join the cast and crew all weekend in a journey down the yellow brick road to the emerald city.